As the second series of Life on Mars approaches the end, check out the Q&As with the esteemed writers/creators Matthew Graham, Ashley Pharoah and Tony Jordan. 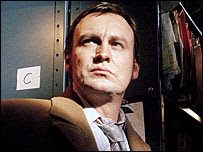 Also, Philip Glenister (who plays Gene Hunt) has been having a pop at TV, in particular soaps. He makes a few interesting and amusing jibes but it's somewhat ironic given that Tony and Ashley have a big soap background. He's allowed - he's the Gene Genie.